The Audi RS3 proves the fallacy of the claim that the bigger, more powerful, and more expensive car is bound to be the better car. There is an intangible quality-something called balance-that characterizes brilliant outliers like the Audi 3 series and, specifically, the rare and elusive RS3. Audi's compact sedan is an infrequent sight, but after driving it, our first thought was, ?Wouldn't anyone who loves to drive rather drive this car?? MacPherson front struts and four-link rear suspension feature Audi magnetic ride, though a fixed sport suspension is optional. Stopping this runaway train are standard eight-piston monobloc brake calipers in front, but our car was equipped with optional carbon-ceramic discs-a part of the aforementioned Dynamic plus package. With the RS3, it's silly not to go all the way. Wheels are 19-inch, five-spoke alloys with summer performance rubber. While its footprint is compact, the RS3 registers a high reading on the visual aggressiveness meter. Flared fenders and a more aerodynamic front and rear fascia define the stance, while the optional Black optic package adds gloss-black exterior trim that complements Audi's trademark gaping maw of a grille-a black void that looks as if it might swallow slower cars as it overtakes. A rear trunk-mounted spoiler lip (nothing embarrassing) and two black oval exhaust outlets distinguish the RS from S3 and A3 models in the 3 Series. 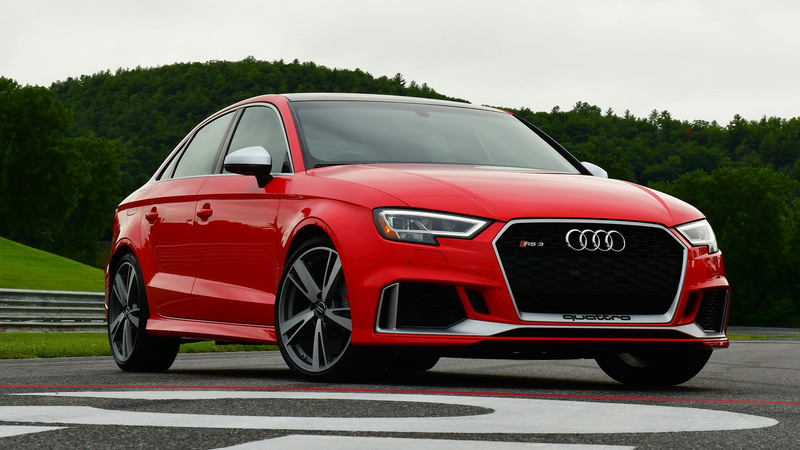 The body and chassis of the RS3-like all Audis-are fabricated in weight-conscious aluminum, a material Audi has championed from the beginning, tipping in at a tick under 3,600 pounds. First-timers will marvel at how light and easy the doors are to close, but when they do, the RS3 has the heft of a bank vault. Our example was finished in bright Catalunya Red metallic, a sort of tomato hue that seemed to recommend a Bloody Mary with every glance. Audi's beautiful nonmetallic Nardo Gray would be our first pick. The car-made in Hungary and not Germany-will appeal to lovers of detail who appreciate top-tier fit and finish. Inside, all is calm, though the contrast-diamond stitching on the leather seatbacks lends a very sporting feel. Sport seats are especially comfortable, and the flat-bottom steering wheel adds just the right amount of flair-and knee room. Big aluminum pedals with rubber treads establish the tone for serious drivers. Infotainment is what Audi does really well, and it's here that the virtual cockpit in front of the steering wheel acquits itself admirably, with a 12.3-inch display for instruments and data. A seven-inch, center-console pop-up screen displays infotainment information. Ordinarily, with cars this exciting to drive, we don't bother to turn on the music for more than a cursory evaluation of sound quality and function. That said, the optional 14-speaker, 705-watt Bang & Olufsen sound system-engineered especially for the 3 Series-makes a good argument to upgrade to much better sound than the standard system. The panoramic sunroof is standard, though manufacturers shouldn't assume everyone is enamored of hot, transparent glass instead of the aesthetic continuity of a metal roof in body color. As cars from manufacturers get larger and more expensive across all model lines, we are reminded how much we treasure the practical advantages-and plain fun-of driving smaller cars. Whether negotiating a parking space or threading the needle through city traffic, smaller is smarter-and more responsive. Throw 400 horses at the equation, and all of a sudden, Audi's littlest sedan is wearing big-boy pants. Priced from $54,900, our loaded model had an MSRP of just under $67,000, putting it near the top of our fun-for-dollar list.